The finale of ‘How to Eat Like a Child and Other Lessons in Not Being a Grown-Up,’ with Director Tracy Allen and the entire cast. 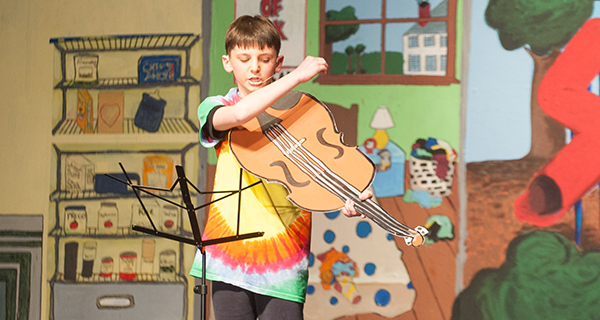 On March 29, 30, and 31, the Blake Middle School Theater presented the musical “How to Eat Like a Child and Other Lessons in Not Being a Grown-Up” by Delia Ephron, John Forster, Judith Kahan. The production was colorful, energetic, fun, and larger-than-life, with excellent performances all around. The set immediately transported the audience into the make-believe world of the kids in the play. It was painted broadly and in primary colors. Objects such as telephones, donuts, vegetables, violins, and microphones were colossal, so they would appear as they do to children. Every child wore a basic layer of black clothes. On top of that layer, each child had a unique layer of colorful clothing, such as a jacket, skirt, leggings, hair ribbons and other embellishments. Between the sets and the costumes, the stage appeared like a kaleidoscope or whirl of moving color. How do kids make sense of the larger world around them? Lesson #5 How to Practice the Violin, with Sean Narkewich, Spencer Joline, Theo Papadinoff, and Matt Goldman. Everyone in the audience has been through the same situations while growing up, so they could relate to the scenes the children presented. The audience may have forgotten some of the intricacies involved, but the lessons brought them right back to mind. Do you remember when your brother annoyed you by repeating everything you said, right after you said it? Or when it seemed that whatever answer your parent gave you, it really meant “No”? Or bragging contests with your schoolmates at recess? Each of the lessons began with two girls dancing sweetly onto the stage and presenting the lesson title, which was written on a flip chart. The actors then entered the stage to dramatize the lesson. The actors spoke clearly and embellished their lessons skillfully with effective gestures, made broadly enough to convey their meaning to the audience. They convincingly communicated the boredom, questioning, frustration, conniving, and playfulness of being a child with facial expressions, tone of voice, and movement. They danced, sang, and played with the energy and excitement of little children, even though they are now so much older. They were also skilled in timing, relating humorous situations so the audience could laugh along with them. Lesson #5 How to Practice the Violin, with Theo Papadinoff. The set crew ably made quick and unobtrusive scene changes and had the props ready for the actors. The tech crew had command of their jobs, so that lights and sounds were presented seamlessly. 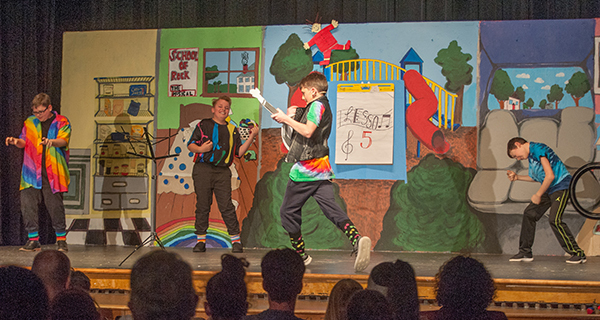 Upon seeing the middle school actors and crews present this lively and fun play so well, the audience could just imagine how successful they will be in high school theater and beyond, as they already have developed such a solid foundation in the fundamentals of stagecraft. Congratulation to the Blake Middle School Theater for a job well done!